Browsing through a number of websites today while trying to find an interesting place to start for this month's Six Degrees of the Library Collection, I came across an obituary for Sarah E. Wright, an author who's name was unfamiliar to me, but who held an important place in American literary history. Wright was the author of one - and only one - novel. She may not have been prolific but her one title, 1969's This Child's Gonna Live, was celebrated in its own time (including being named a NY Times notable book) and remains well regarded today (reprinted as recently as 2002 by the Feminist Press). The obituary describes the book as "[portraying] the lives of an impoverished black woman and her family in a Maryland fishing village during the Depression". 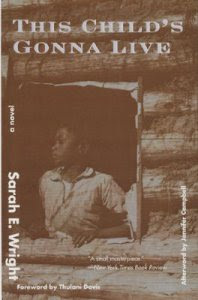 Wright's book and her writing is often compared to that of another female writer of the same era - Zora Neale Hurston. Although Hurston was more prolific, the two shared the common theme of focusing on the black, female experience, while other notable authors of their time were more focused on the experiences of the African American male. Zora Neale Hurston was an author fiction, essays and plays but is best known for her novel Their Eyes Were Watching God. She was born in Alabama but moved to Eatonville, Florida as a toddler and considered Florida her home. Hurston had a happy and stable childhood, but at the age of 13 the death of her mother was a life changing event. Hurston shares this sad fact with another celebrated female author: Virginia Woolf, whose mother also died suddenly when Woolf was 13. Woolf, a British author of essays and fiction is considered a feminist writer and her book "A Room of One's Own" is a standard text in women's study programs. Woolf was also a member of the Bloomsbury Group, a collective of British writers, artists and intellectuals who were very influential throughout the 20th century. In 1998, American author Michael Cunningham used Virginia Woolf and her novel Mrs Dalloway as inspiration for his novel The Hours. The book intertwines the lives of three women in three times - Woolf herself in 1920s England, Laura Brown a character who lives in 1940s California and reads a great deal of Woolf, and a present day New York City resident, Clarissa Vaughan who spends her day planning a party in a very Mrs. Dalloway fashion. The book was a huge success, winning the Pulitzer Prize and being adapted into a film several years later. The film was directed by Stephen Daldry. Daldry has also recently adapted the film version of the book The Reader by Bernhard Schlink. Although The Reader is an historical novel, Schlink began his writing career writing mystery novels and is the author of a series of books featuring the character Gerhard Self a former prosecutor turned private detective. The first book in the series is Self's Punishment. Schlink's professional background as a lawyer and law professor undoubtedly played a role in his early writings. This he has in common with another famous lawyer-turned-writer: John Grisham. Perhaps the most famous name in the legal thriller genre, Grisham has a new book coming out this fall. 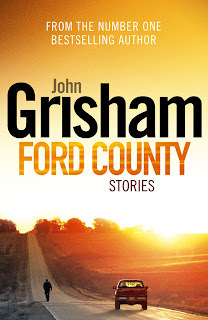 Although the new book Ford County, shares a setting with Grisham's first thriller A Time to Kill, this book is not a legal thriller, instead it is a collection of short stories that examine the lives and experiences of people who populate the area.